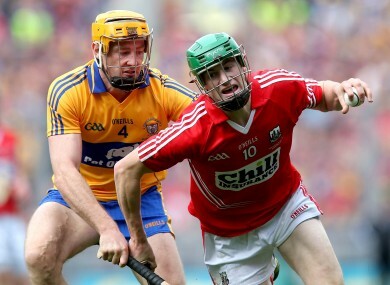 Cork's Seamus Harnedy and Cian Dillon of Clare. CORK LOOKED TO have pinched the Liam MacCarthy Cup after Patrick Horgan scored in injury time but Clare’s Domhnall O’Donovan grabbed a point with the last play of a pulsating game to ensure a draw. Clare were in the ascendancy for most of the game, at Croke Park, but Cork clung on and rocked The Banner with three second-half goals. The Rebels led with a minute to play but there was just enough time for one last attack and O’Donovan made it count. The two sides will do it all over again but hurling supporters across the country will relish another match — on 28 September — if it has even a fraction of the drama from today’s clash. Clare got the scoring underway after three minutes when Darach Honan took a short pass from a sideline cut and had plenty of time to size up the sticks. Colin Ryan, scorer of 51 championship points [this summer] before the final, slotted over his first free to double the lead. Cork hit back through Seamus Harnedy on six minutes. A huge aspect of The Banner’s success this season has been their multiple scoring threats. It was to the fore again as John Conlon and Tony Kelly joined the scorer’s list. In between their points, Cork’s Patrick Horgan belted over a free. He added two more to level the scores at 0-4 after 11 minutes yet Colin Ryan edged Clare back in front. There were then two moments of controversy as Shane O’Neill escaped with a yellow card after swiping at the head of Darach Honan. Referee Brian Gavin consulted with the umpires behind the Cork goal and opted to book O’Neill and Honan for jostling. On 17 minutes, Patrick Kelly made a super stop in the Clare goal but a 20-yard free [not a penalty] was awarded for a player deliberately handling the sliotar off the ground. Cork goalkeeper Anthony Nash unleashed his free but Kelly blocked it with his backside after charging out from his line. Podge Collins compounded Nash’s frustration by knocking over a point as he charged back to his goal. Ryan’s free-taking accuracy was most impressive and he pointed again, on 21 minutes. Collins, who was fouled by William Egan for that free, then set up Conor McGrath for a fine score. Horgan tagged a point back for Cork before Nash saved well from a swiped effort on goal by Darach Honan. Ryan and Horgan traded frees to make it 0-9 to 0-6 after 27 minutes. Quick thinking from Ryan set up Collins for another score before he added another free. Horgan returned the favour on 31 minutes. Cork’s second point from play came on 32 minutes when Harnedy offloaded for Daniel Kearney to slot over. Kelly stretched Clare’s lead to four points but Brian Murphy and Horgan knocked over important scores to leave it 0-12 0-10 at the break. Colm Galvin battled well to set up Kelly after less than a minute of the second half and his point was followed up by a Ryan free to make it a four point game again. That lead was drastically cut, however, when Conor Lehane ran 25 metres and unleashed a shot that flummoxed Kelly and rippled the net. Ryan settled Clare nerves by pointing from his next free opportunity, on 42 minutes, but that man Horgan was never going to miss when offered a straightforward free opportunity from 40 metres out. Collins scored a superb individual point in the to-and-fro final and Kearney was quick to respond as he fired over a towering point. Clare’s forwards were drawing fouls from the Rebel defence all afternoon but letting them run unchecked was also causing problems. A three-on-two overlap was spurned before Patrick Donnellan found an unmarked McGrath to score from an acute angle. Conlon chipped in with an assured score and Ryan knocked over a long-range free to make it 0-19 to 1-12 after 52 minutes. Harnedy showed some fight to score for Cork but Ryan answered back with his first score from play. He followed up with his ninth free of the afternoon and the lead was five points with 15 minutes to play. Cork’s second goal of the game arrived courtesy of an Anthony Nash rocket. Luke O’Farrell was fouled as he neared the Clare goal and Nash was summoned to take his second 20-yard free. The goalkeeper targeted the top left-hand corner and dispatched it magnificently. Less than 60 seconds later and Nash was up the pitch again and asked to take a penalty that could put his team ahead for the first time. He went for the same spot but Kelly got his hurl to it and deflected the effort onto the crossbar. Clare were buoyed by Kelly’s heroics and scored the next two points, from Colin and Conor Ryan [the point of the match]. Lehane hit back with a point and Clare missed a glorious goal chance when Collins kicked at fresh air with just a sprawling Nash to beat. Patrick Cronin levelled matters with seven minutes to go when he went high and mighty, leaving Kelly planted to the spot. The Cork fans erupted but Clare still had Ryan and his nerveless free-taking as the edged ahead. Horgan bit back with a score of his own and had the last laugh with his superbly taken point from play. Email “Cork and Clare to do it all over again after thrilling All-Ireland draw”. Feedback on “Cork and Clare to do it all over again after thrilling All-Ireland draw”.